For a limited time, CD FrontEnd GOLD, will be offered for a special of only $219.9 for a limited time for this version! Click here to order now! Professional autoplay/autorun CD - DVD authoring software: make Web-like pages, create presentations, big catalogues, CD business cards, brochures, slide shows, build menus, run files and programs, show popup windows... all with this all-in-one versatile program!Main benefits:- easy to use, fast, handy: one presentation, one source file- frames, text styles, popup windows, mouse over sensitive images, sounds, video, forms, Flash, visual linking (no broken links, never! 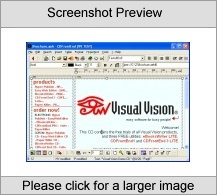 ): feature rich- can launch any kind of file: PDF, PowerPoint PPS PPT, DOC, AutoCAD...; any kind of video and audio: MP3, MPEG, WMV, AVI...- CDs freely distributable, no royalties- search engine automatically included in the CD/DVD: full-text search, boolean search, keyword search- database import through CSV: MS Access, Oracle, Fulcrum, Paradox, DBase, FoxPro, MySQL, Interbase, Firebird, DB2... it can automatically populate a catalogue (it creates categories, subcategories, thumbnail images...)- shopping cart support (also from database if needed)- autorun CD with one click- built-in browser (no Internet Explorer or other browsers required; completely self-contained, will run off the CD without problems on any PC; not blocked by popup killer applications);- print / copy protection- expiration date- password protection for all or part of the presentation;- different passwords for different users (the CD/DVD remains the same so it can be mass replicated)- can include Viewer programs in case the user don't have Adobe Acrobat, Word and so on...; so everybody will be able to see your CD without any problems- full screen capability; you can also set the window size and position- automatic photo gallery / thumbnails feature, for creating autorun CDs with your photos!- small and smart: both the editor and the CDs do run (quickly!) on old PCs (from Pentium I 100MHz and Windows 95! )It is simply the most productive authoring application for creating CDs / DVDs. Try the free trial version first, or click here for pricing/to purchase a full version! Order by phone, fax, cheque, money order, or order securely online!